As the euphoric predictions of a brave new Middle East give way to more tempered expectations, Turkey is increasingly seen as a possible model for the fledgling Arab governments to emulate. According to a recent YouGov survey, 72 percent of Arabs identified Turkey as a "good model" with this figure higher (75 percent) among North African respondents and lower (65 percent) among Syrians and Lebanese. The three main reasons for this choice were Turkey's affinity with the Arab states in terms of culture, religion, and traditions (57 percent); Ankara's perceived prestige "in the eyes of the world" (56 percent); and the influence of Islam in Turkish politics (49 percent). 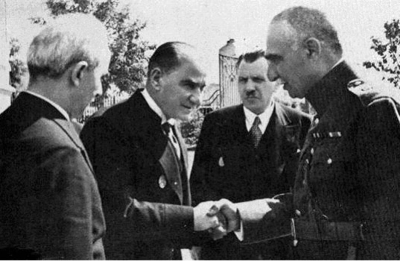 The original "Turkish model," which blended republicanism, nationalism, and secular modernization, was the brainchild of Mustafa Kemal Atatürk (center), the republic's founding father, and was only adopted with limited success by one other Middle Eastern leader, Reza Shah Pahlavi of Iran (right). Interestingly enough, the only Turkish experience that seems to be worthy of emulation is that of the ruling Justice and Development Party (Adalet ve Kalkınma Partisi, AKP), ignoring the "original" Turkish model—secular modernism—and the role it played in post-colonial Middle Eastern history. Yet it was precisely this secular-democratic system that eventually—albeit unintentionally—led to the emergence and triumph of the Islamist AKP, which built much of its legitimacy on the critique of the very system from which it emerged. By contrast, the similarly secularist Arab regimes were ruthless dictatorships that held their subjects in an iron grip until a number of them were swept from power by the recent uprisings. An exploration of the original Turkish model, its strengths and weaknesses, might thus help inform and guide the future. The prevailing narrative of the "Great Arab Revolt" of World War I presents it as the culmination of deep-rooted resentment against four centuries of Ottoman control, ending once and for all any political unity between the Turks and the Arabs. What is less acknowledged, however, is that the Hashemite dependence on Britain, both during the war and throughout the attendant peace talks, can be retrospectively seen as a major mistake, creating a long-term dependency on the great powers and laying the foundations for the Middle East's chronic legitimacy crisis and anti-Western bent. The ambitious anticolonial independence movements launched after the war were thus suppressed or co-opted by the colonial tutelage system. Even more problematic perhaps is that, with the exception of Algeria (and non-Arab Israel), the Arab states gained their independence not through struggle but by the consent of their post-World War II colonial administrators. It was only after (and because of) the latter's imperial decline that they offered independence, leaving behind illegitimate, hastily built governments that were expected to protect the interests of their colonizers without colonial troops. The Turkish republican leadership's obsession with independence and sovereignty, which rejected all forms of mandate, supervision, and foreign "assistance," stood in stark contrast to the Hashemites' acquiescence in joint state-building with the Allied powers as it was the Turkish war of independence (1919-23) that paved the road for modern Turkey to emerge as a fully sovereign and independent state from the ashes of the Ottoman Empire. Turkish independence is almost intrinsically tied to what can be termed the Kemalist project, after Mustafa Kemal (Atatürk), the republic's founding father, with its combination of republicanism, nationalism, and secular modernization. It was first copied by a non-Arab ruler—Reza Shah Pahlavi of Iran (r. 1925-41), who embarked on an ambitious reform program along Turkish lines, which later slowed down because of mounting resistance from the Shiite clergy and finally collapsed altogether after his removal from power by the Anglo-Soviet invasion of 1941. In the 1940s, Syrian Arab intellectuals Michel Aflaq, Salah al-Din al-Bitar, and Zaki al-Arsuzi pioneered the pan-Arab Baath party whose motto, "unity, liberty, socialism," mirrored that of the late Ottoman-era Committee of Union and Progress (with the addition of socialism). And while Egyptian-based Nasserism and Syrian and Iraqi Baathism initially mirrored early Turkish secular nationalism with its emphases on unity, independence, corporatism, and foreign policy neutrality, these movements coincided with the early phases of the Cold War, prompting Arab leaders to abandon neutrality and embrace the Soviet bloc. The anti-Israel agenda of Arab socialism soon echoed the familiar discourse of communism versus colonialism, but it was the Arabs' obsession with Israel that ultimately led to their departure from one of the absolute fundamentals of the initial Turkish model: rejection of all patronage and tutelage relations with outside powers. Just as the Arabs had replaced Ottoman colonialism with British imperialism, they now replaced the latter with Soviet military guardianship for the sake of destroying Israel, which they viewed both as deeply illegitimate and an outgrowth of Western imperialism. At the same time, the Arab secularists suffered from the same problem that dashed the Iranian attempt to emulate the Kemalist model: no decisive victory against foreign control. Reza Shah had no such success and his son, Mohammed Reza, was first crowned by the Anglo-Soviet invaders, then reinstated (in August 1953) in a coup orchestrated by the U.S. and U.K intelligence agenices, the CIA and MI5. And while Nasser's position was boosted by Egypt's resistance to the combined forces of Britain, France, and Israel in the Suez crisis of 1956, this relative success was a direct result of Washington's intervention. By June 1967, Nasser's prestige had all but disappeared as Egypt's crushing defeat in the Six-Day War dealt a mortal blow to his pan-Arab pretensions and deepened his already heavy dependence on Moscow. Nasserism, thus, can be hardly considered a historically sustainable model of sovereignty and independence. Perhaps most importantly, the 1967 Arab defeat was a milestone in the transformation of the projects of Arab unity and socialism. Nasserists and Baathists attempted to counter their loss of legitimacy following the war by redefining the role of their militaries as domestic tools of repression rather than defense organizations against foreign threats. The clearest manifestation of this process was the rise of the dreaded mukhabarat security-intelligence branch, which dealt with domestic dissent and challenges to state legitimacy as a direct result of the states' inability to deal with the Israeli military or U.S. involvement in the Middle East. The era of Middle Eastern military dictatorships, effectively marking the Cold War and post-Cold War history of the Middle East, is in many ways the history of this militarization of Arab socialism. From a unity, liberty, and corporatism-based doctrine, it assumed a repressive-militarist character. In contrast to the Arabic-speaking countries, Turkey went through its quasi-dictatorial Kemalist period much earlier (1925-47), overlapping with a similar pattern of post-imperial dictatorships in Europe. European, as well as Kemalist, authoritarian periods began with the collapse of empires at the end of World War I and ended after World War II. Turkey switched to a multiparty democracy in 1947, following which the founding Republican People's Party (CHP) was democratically forced into opposition in the 1950 elections. Despite constant military tutelage over politics (a pattern that could be observed during the Cold War period in a number of Western countries, notably Spain and Portugal) and three military coups, Turkey's relationship to democracy was much different from that of the Arab states, which lived under the sustained and permanent yoke of dictators and whose behavior mirrored that of their former colonial administrators. While it is sometimes argued that Kemalism is a dictatorial ideology in and of itself, placed in its proper context against the backdrop of contemporary European and Middle Eastern experiences, the system reveals its instrumental versus permanent nature. Notwithstanding brief similarities, Kemalism and Arab nationalism went in two separate ways, manifested in two very different modes of governance. While publicly subscribing to his predecessor's legacy, Atatürk's foremost chieftain and successor, Ismet Inönü, was very much his own man. Struggling to surmount the uncertainty attending the death of Turkey's founder, Inönü faced a legitimacy crisis domestically as well as the formidable military challenge of keeping Turkey out of World War II by deterring a massive Red Army in the Caucasus and a Nazi army in Thrace; this period is generally regarded as a dictatorial episode. This undemocratic interlude notwithstanding, it was Inönü who in 1947 inaugurated the multiparty era by enabling the establishment of opposition parties—a process culminating in the defeat of his own party in the 1950 elections. And while Inönü might have made this transition out of external necessity (joining the North Atlantic Treaty Organization [NATO] and the U.N.) rather than true conviction, his political behavior as leader of the opposition in 1950-72 indicates the extent to which he had internalized and believed in the principles of multiparty democracy—a behavioral pattern entirely absent in the perpetually authoritarian Muslim Middle East. The original Turkish model has been criticized because of the four military coups (1960, 1970, 1980, 1997), alongside the generals' influence on "high politics" though it was probably no more flawed, at least until 1980, than Franco's Spain, Salazar's Portugal, the Greek military junta period, or even the De Gaulle era in France. Actually, the foremost problem of post-Atatürk Kemalism was its inability to articulate a peacetime identity for itself and the country, requiring a constant narrative of domestic and foreign "foes" to be able to sustain its relevance in politics. At the same time, these limitations were challenged by a number of successful political parties such as Adnan Menderes' Democrat Party or Turgut Özal's Motherland Party. Perhaps the most ambitious attempt to define a peacetime ideology for Turkey was that of the AKP, which accomplished more than its predecessors in terms of trying to establish a more flexible, accommodating Turkish political identity—at least during the first years of its tenure. Thus the "old" Turkish model—early secular-modernism—could and still does offer a model for the Arab states by producing governing classes that have upheld the sovereignty and independence of the Turkish state—within an imperfect democratic system, but one that is far more representative than the failed Arab authoritarianism. This is because the model always saw its authoritarianism as a temporary condition that prevailed only in crisis situations and returned willingly to full democracy once the crisis situation had been resolved. It is important to note that the flagship party of Kemalism, the CHP, has remained in the opposition since the first multiparty elections of 1950 and never assumed a militarist character to take back power. While the prevalent Islamist critique would disagree with this statement, it must be remembered that Inönü's CHP had a problematic relationship with the military and its coup attempts during the multiparty period and that the party was shut down following the 1980 coup. The Arab states, by contrast, have been marked by a constant inability to establish true sovereignty and independence. When finally attained, governments lacked legitimacy, which in turn created perpetual dictatorships and sustained militarization of the ruling elite. These facts have potential implications for the future trajectory of the Arabic-speaking countries. Arab societies have, at long last, successfully launched revolts against their long reigning dictatorial and authoritarian regimes, banishing the ghosts of the Hashemite World War I revolt with its colonial and post-colonial consequences. Soon after the removal of their dictators, many of the Islamist movements that came to prominence, such as Egypt's Muslim Brotherhood and Tunisia's Ennahda movement, officially stated that they were looking at Turkey's AKP as a role model or inspiration. Morocco's post-revolutionary government party even named itself the Justice and Development Party. While the AKP is seen by Arab revolutionaries as a successful Islamist party, party leaders have repeatedly denied this label insisting instead on their definition as "Muslim conservatives; not Islamists." While leading AKP figures have criticized the shortcomings of Kemalism, they have also not shied away from passing judgment on the "extremes" of the Islamist Welfare Party tradition (1983-98) and its leader, Necmettin Erbakan. During his September 2011 visit to Egypt, Turkish prime minister Recep Tayyip Erdoğan went so far as to call on Egyptians "not to be afraid of secularism," drawing criticism from the Muslim Brotherhood there. It would seem then that notwithstanding its Islamist nature, much of the AKP's appeal stems from its pragmatic adaptation to the political rules of the game. Moreover, two of the most attractive aspects of the "AKP model" in Arab perception—Turkey's apparent economic success and growing international prestige—owe much of their success to contributions of the secular elite. Turkey's economic "miracle," for example, is based upon the 2001-05 stabilization program whose foundations were laid by a secular high-level World Bank technocrat, Kemal Derviş (currently the U.N. Development Program administrator). Many Islamists play down the importance of Derviş's economic model and argue that his one-year ministership (2001-02) cannot possibly define the AKP's ten-year success, perhaps forgetting how John Maynard Keynes' 1936 theory set the tone of global economy for the next forty years. Likewise, the AKP's soft power activism rests upon a network of deterrence antecedents established by its predecessors in the late-1990s; and while the AKP's "zero-problems" policy vis-à-vis neighbors such as Greece, Syria, Iran, and Iraq may be seen as a critique of Turkey's deterrence policies of the 1990s, the policy, nonetheless, was only able to function as a result of the strategic-military achievements of these years. Two foreign policy successes attributed to the AKP—improvement of relations with Greece and Syria—were in fact initiated during the tenure of another secular technocrat, Ismail Cem, diplomat and minister of foreign affairs in 1997-2002. Turkish-Greek rapprochement was a product of Cem's hard work with his Greek counterpart, George Papandreou while Syria's more cooperative attitude toward Turkey was a direct result of Ankara's threat of invasion in November 1998 in response to Hafez Assad's harboring Abdullah Öcalan, the leader of the Kurdish nationalist organization, the PKK (Kurdistan Workers' Party—Partiya Karkerên Kurdistan). Now that this policy has been totally discredited—with the honeymoon with Damascus (and its Iranian ally) souring over the Syrian civil war and relations with Greece in tatters following Ankara's threats to Cyprus over the gas finds in the eastern Mediterranean—it seems that the AKP's "zero problems" policy has been based on a flawed grasp of the strategic and political foundations inherited from their secular predecessors. Likewise, given the growing signs of an economic slowdown, if not imminent collapse, the AKP's economic acumen seems less impressive. Without properly contextualizing the AKP's success, one can expect more existential frustrations for the nascent Arab governments. While the AKP has successfully transcended its original Islamist constituency to establish itself as a party of the masses, it is not a model that post-revolutionary governments can emulate precisely because it has not disavowed its Islamist precepts. In the apt words of academic Sebnem Gumuscu: "There is no 'Turkish model' of an Islamist democracy." The AKP model can primarily be replicated by countries that have already switched to a functioning and legitimate democratic system, its success being paradoxically rooted in a strong, independent, and legitimate secular-democratic system and its simultaneous critique of and outgrowth from it. The new Arab rulers, on the other hand, have succeeded in eliminating regimes with contested legitimacy through revolution and pushed their countries into a state of uncertainty, soul searching, and identity crisis—all normal and temporary aspects of post-revolutionary societies. They do not, however, enjoy the AKP's advantage of functioning as a democratically legitimate government within a fully independent and sovereign state system. Quite the opposite, these movements have gone "back to the future" and operate in a state of similar uncertainty as their predecessors faced during and after World War I. Perhaps they do not confront the same kind of spatial and geographic uncertainty, but in terms of regime type, institutions, and reorganization of capital relations, the Arab upheavals have created circumstances identical to the legitimacy and sovereignty questions raised by the "great Arab revolt," none of which resemble the AKP experience. At this critical juncture in their history, Arabs can perhaps learn from the original Turkish experience. Rather than the peacetime environment giving rise to the AKP, the Kemalist model of state legitimacy and identity-building in times of crisis and uncertainty suits the immediate needs of post-revolutionary Arab societies. Aptly recognizing the nature of external and domestic challenges confronting Turkey, Atatürk skillfully redefined the nature of Turkish nationhood and laid the foundations of early twentieth-century secular-modernization, something that could serve as a model for the Arabic-speaking countries. It also bears noting that while Atatürk's rejection of foreign involvement and his armed struggle against the Allies led to the emergence of modern Turkey as a pro-Western country, the Hashemite decision to outsource the cause of pan-Arabism to outside powers laid the foundations of modern anti-Westernism in the Middle East. This reality has important implications for Western policy toward the post-revolutionary Arab societies. For one thing, history tells us that the concept of Western-friendly regimes is a mirage and that short-term independence from foreign control produces more sovereign and cooperative administrations over the longer term. For another, those Arab intellectuals emphasizing the indispensability of U.S. financial support for establishing the legitimacy of the post-revolutionary governments are effectively repeating the Hashemite historic blunder of outsourcing the cause of a revolutionary movement to the goodwill of foreign powers, something that is liable to exacerbate local dependence and anti-Western sentiments. The Arab revolutions can only succeed if they produce unique and case-specific models rather than emulating other historical experiences, let alone outsourcing their state building to external factors. But if they, nevertheless, find the Turkish model so appealing as to merit a serious debate, it should begin with Kemalism—not the AKP. H. Akın Ünver is a faculty fellow in the Department of International Relations, Kadir Has University, Istanbul, and the winner of the Middle East Studies Association's 2010 Social Sciences Dissertation Award. This article was written during his Ertegün Lectureship at Princeton University's Near Eastern Studies Department. The author wished to thank Andrew Arsan for his valuable suggestions on this article. "Should Arabs follow the Turkish political model?" YouGov Doha Debates, Feb. 9, 2012. Touraj Atabaki and Erik Jan Zurcher, Men of Order: Authoritarian Modernization under Ataturk and Reza Shah (London: I.B. Tauris, 2004), pp. 44-65. L. Carl Brown. Imperial Legacy: The Ottoman Imprint on the Balkans and the Middle East (New York: Columbia University Press, 1996), pp. 139-48. Avraham Sela, "Abd al-Nasser's Regional Politics: A Reassessment," in Elie Podeh and Onn Winckler, eds., Rethinking Nasserism: Revolution and Historical Memory in Modern Egypt (Gainesville: University of Florida Press, 2004), pp. 179-205. Milton Viorst, Sandcastles: The Arabs in Search of the Modern World (Syracuse: Syracuse University Press, 1995), pp. 141-9. Jason Brownlee. Authoritarianism in an Age of Democratization (Cambridge: Cambridge University Press, 2007), pp. 18-21. Taha Parla and Andrew Davison, Corporatist Ideology in Kemalist Turkey: Progress or Order? (Syracuse: Syracuse University Press, 2004), pp. 143-209. John M. VanderLippe, The Politics of Turkish Democracy: Ismet Inonu and the Formation of the Multi-Party System, 1938-50 (Albany: State University of New York Press, 2005), pp. 21-6. Ergun Özbudun, Perspectives on Democracy in Turkey (Ankara: Turkish Political Science Association, 1988), pp. 11-8. Southeast European Times Türkiye (U.S. European Command), Nov. 22, 2011. BBC News Africa, Nov. 27, 2011. See, for example, State Minister Egemen Bagis's statement, "İslamcı olmadığımızı kanıtlamak için illa haç mı çıkarmamız lazım?" Zaman Online (Istanbul), Jan. 12, 2008. See for example, State Minister Bülent Arınç's statements, "Resmi Yenilikçiden Erbakan Eleştirisi," NTV Online (Istanbul), July 8, 2011. The Wall Street Journal, Sept. 15, 2011. Erinc Yeldan and Umit Cizre, "The Turkish encounter with neo-liberalism: Economics and politics in the 2000/2001 crises," Review of International Political Economy, Aug. 2005, pp. 387-408. Svante E. Cornell, "What Drives Turkish Foreign Policy?" Middle East Quarterly, Winter 2012, pp. 13-24; Damla Aras, "Turkish-Syrian Relations Go Downhill," Middle East Quarterly, Spring 2012, pp. 41-50. David P. Goldman, "Ankara's 'Economic Miracle' Collapses," Middle East Quarterly, Winter 2012, pp. 25-30. Sebnem Gumuscu, "Egypt Can't Replicate the Turkish Model: But It Can Learn from It," Sada, Carnegie Endowment for International Peace, Jan. 12, 2012. See, for example, Sabina Dewan "Helping Complete the Arab Spring," Center for American Progress, Washington, D.C., Jan. 3, 2012. Related Topics: Democracy and Islam, Turkey and Turks | Winter 2013 MEQ receive the latest by email: subscribe to the free mef mailing list This text may be reposted or forwarded so long as it is presented as an integral whole with complete and accurate information provided about its author, date, place of publication, and original URL.